Yard sales are amazing, no matter what side you’re on. Maybe you’re behind the table and you’re making money off of stuff that you were ready the throw in the garbage? Or maybe you’ve ventured out, early in the morning, to take a look through people’s unwanted items and find a treasure for yourself (I know that our captain, GBD, finds a lot of lost Nintendo items to add to his collection from yard sales). Over the weekend my wife and I sold a bunch of our belongings that we didn’t need (some of them were still unopened wedding gifts :|). We had DVDs, old kitchen table, artificial flowers, pots and pans, odd knick knacks, etc.. In the end, we made over $170 (of which I’ve already put some towards a delicious sushi dinner). 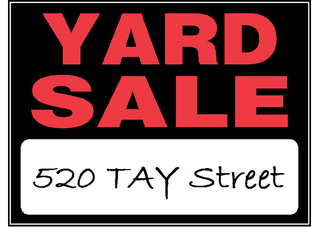 My questions are: Do you have yard sales to try and get rid of your unwanted belongings? On the other hand, do you go out and scour yard sales for the perfect find?